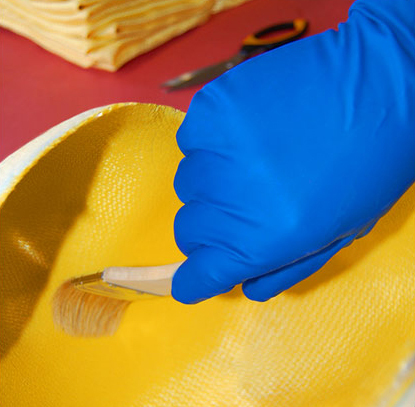 Wet layup is a process where dry fibers and resin are brought together in an open mold, and a vacuum bag is placed over a freshly laminated part that acts like a clamp and uses atmospheric pressure to consolidate fibers and control the resin content. Dry cloths are then placed in a mold according to the layup schedule. Then a vacuum bag is placed over the fibers while resin is introduced from outside of the bag using strategically placed resin suction tubes and other methods to wet out the dry pack. The Pre-impregnated cloth is used in place of wet resin and dry cloth. A temperature controlled mold cavity is packed with dry fibers according to the layup schedule, and then a vacuum is pulled in the mold cavity while a second vacuum is used to clamp the two molds together. Hollow molds filled with resin are placed in a computer controlled spinning machine. Molds are accurately rotated according to specific mold parameters until the resin cures, producing hollow parts. Urethane resin is dispensed through a computer controlled pumping system into matched tooling or hollow cavity roto-molds.